"Bug bite" redirects here. For any of various characters in the GoBots and Transformers fictional universes, see Bug Bite (Transformers). With insect stings a large local reaction may occur (an area of skin redness greater than 10 cm in size). It can last one to two days. It occurs in about 10% of those bitten. mosquitoes exposed appendages usually not Low raised welt, itches for several hours. 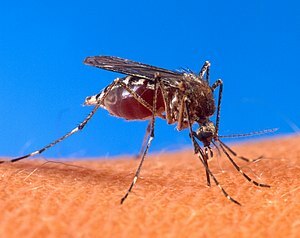 midges and no-see-ums exposed appendages usually Itches for several hours. mites mainly on the trunk and extremities usually not Intensely itchy welts and papules that may last for days. ^ Goddard, Jerome (2002). Physician's guide to arthropods of medical importance. Boca Raton: CRC Press. p. 14. ISBN 978-0-8493-1387-5. ^ a b Ludman, SW; Boyle, RJ (2015). "Stinging insect allergy: current perspectives on venom immunotherapy". Journal of Asthma and Allergy. 8: 75–86. doi:10.2147/JAA.S62288. PMC 4517515. PMID 26229493. ^ Maynard, Robert J. Flanagan, Alison L. Jones ; with a section on antidotes and chemical warfare by Timothy C. Marrs and Robert L. (2003). Antidotes. London: Taylor & Francis. p. 118. ISBN 9780203485071. Retrieved 7 June 2016. ^ Alsaad, KO. ; Ghazarian, D. (Dec 2005). "My approach to superficial inflammatory dermatoses". J Clin Pathol. 58 (12): 1233–41. doi:10.1136/jcp.2005.027151. PMC 1770784. PMID 16311340.